Happy Thanksgiving weekend. I am hoping that everyone out there found a few moments to celebrate and reflect on the true blessings of ‘thanksgiving’. As the years have passed, I find it much easier to realize how so many ‘simple’ things make my life so much more richer – a call from a friend, watching children play and giggle, the aroma of home cooked food – well you get the idea. I remind myself I need to practice ‘thanksgiving’ every day! I have been inundated with projects and project ideas the last 2 months, with far more creative possibilites than I likely ever will complete; I know many of you are not foreign to this same situation!! But this year, I am extremely grateful for even being able to stitch, sew, and design; having broken my shoulder earlier in the year, it has taken much therapy and effort to resume these activities…and I may not ‘be in the clear’ just yet as the doctor is showing some concern that I may still have some damage to the soft tissues. ARGHHHH! Please no! Stay tuned! Meanwhile, I’ve been stitching like mad to get a few ideas made. Thought I’d share a few of those with you in the next few posts. Not finished – still waiting for border finish and backing! 24 pockets – dripping with snow! A surprise in each one! My version of the yule tree – ready for ‘trimming’! 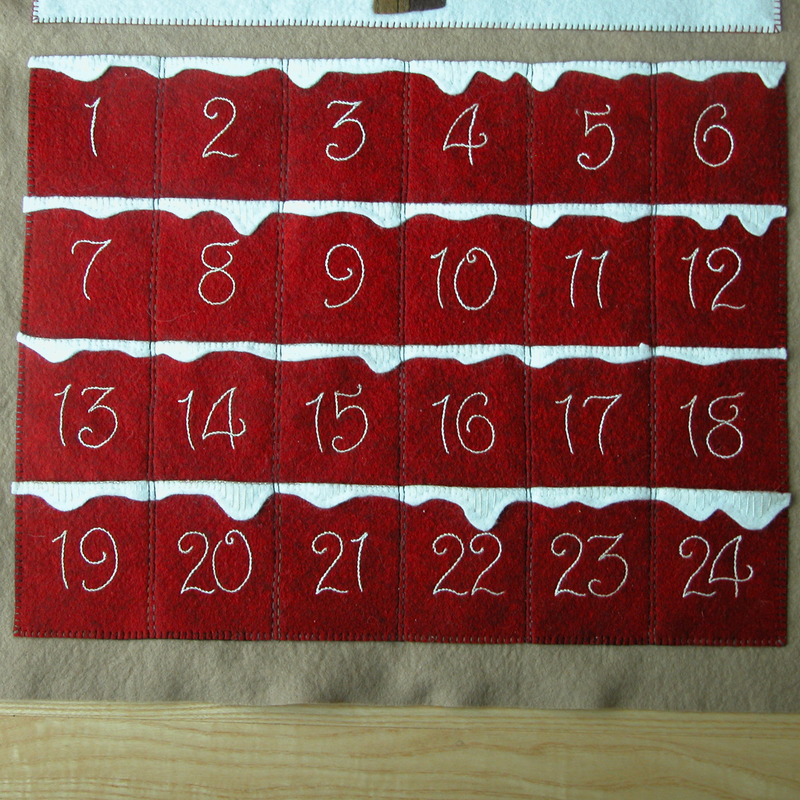 A Yule/Advent type calendar has been on my mind for a couple of years. 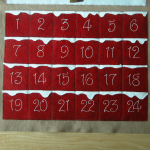 When my kids were little I bought an advent calendar felt kit(I think it was by Bucilla?) with all the sequins, threads, and felt cut outs. This hung on our kitchen wall each holiday season and I remember the kids ‘fighting’ over who’s turn it was to see what that day’s pocket held, each hoping to get the ‘neat ones’!! 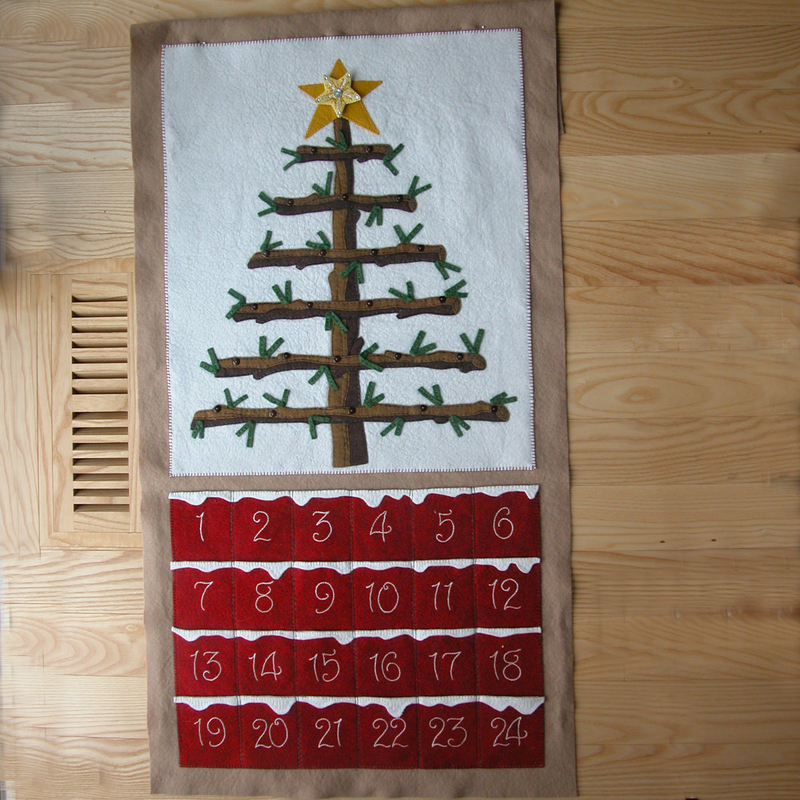 I never thought that what seemed to be inexpensive acrylic felt would last very long and I even lined the back of the calendar with fabric hoping to make it last longer. Well, who knew that it would still be around 30+ years later!! Yikes! (By the way – just for kicks I checked on line in vintage stitchery and discovered the same kit for sale – $149.00!!! Holey- moley!) The calendar now resides with my oldest daughter who has 4 little ones. We’ll see if it survives so many little hands! However, that left my youngest daughter and my son without a calendar. Said son has requested a ‘northern’ themed nativity (I’m still thinking on that one!) and youngest daughter – who doesn’t have children at the moment – was open to either my creating a similar one, or perhaps something new. I had made a tracing of the original one in case I needed it for just such a purpose. I came up with this concept and have been working on it – seems like night and day! – for the past month. Considering all the hours I’ve put into it – and short of someone paying me MANY dollars for my work and design – I suggested that this could be hers. She seems quite happy with that idea. The calendar is close to getting finished. You can see it unfinished in the photos above. It’s about 21″ x 39″ give or take, and I still have to decide how I want to make it hang; a bit bigger than I might have liked, but I had to consider the size of the ornaments regarding stitching and embellishing. The pockets are lined with fused fabric. I didn’t want the harshness of ‘straight dowel’ branches so I did rough logs (which hide the buttons for handing the ornaments!) 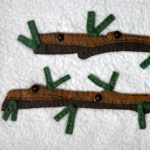 and added a few green ‘needles.’ I love using Valdani variegated threads for these applications – the subtle colors add so much even with simple stitches! 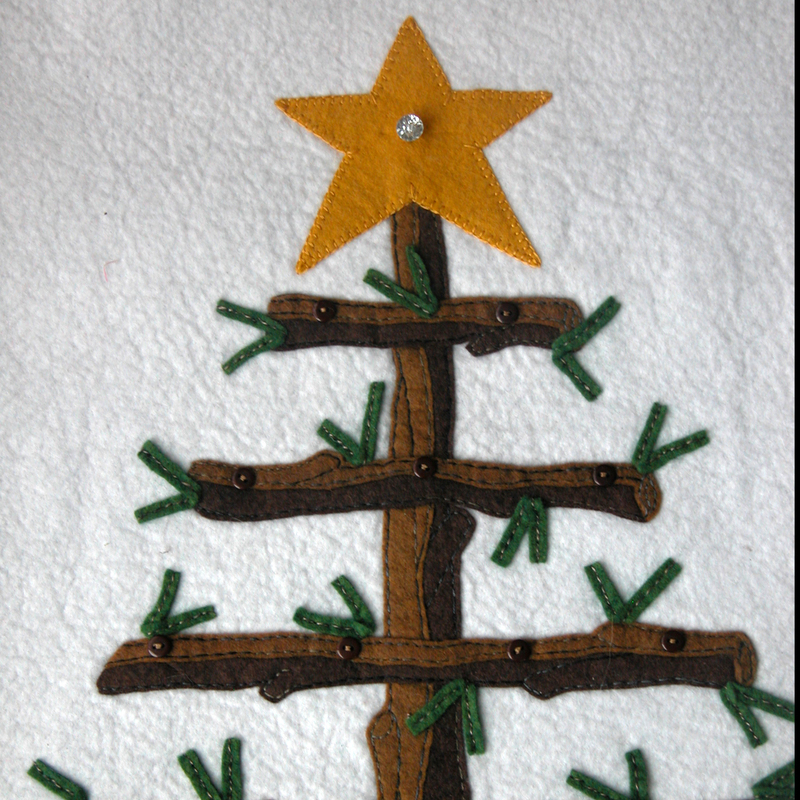 Tree top with ‘bright star’ ornament buttoned on! 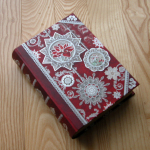 ‘Book box’ found at Tuesday Morning – for storing unused ornaments! 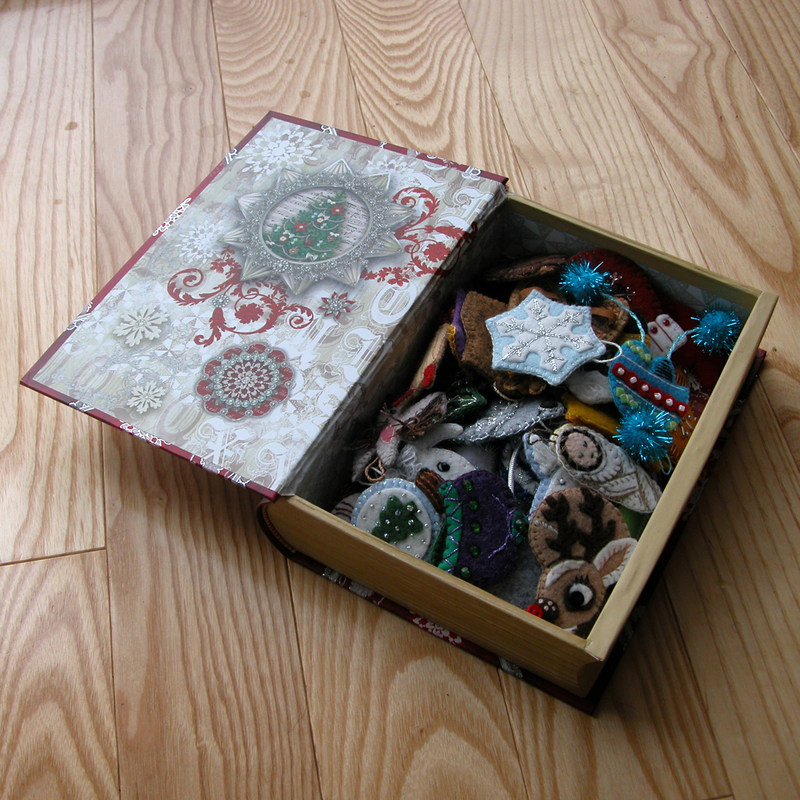 ‘Book box’ shown open and holding ornaments – should I line this with felt??? Yule Tree shown with some of the ornaments! Despite the work, lots of fun! Despite all the ideas it was hard to get started on the ornaments. So much to think about. I made a template for the size of the pockets and used tracing paper to make sure every ornament would fit in the pockets (This was a bit of an issue in the one my kids had – some of the pieces didn’t quite totally fit in the pockets, so they could ‘cheat’ and see what the surprise was for some of the days!) 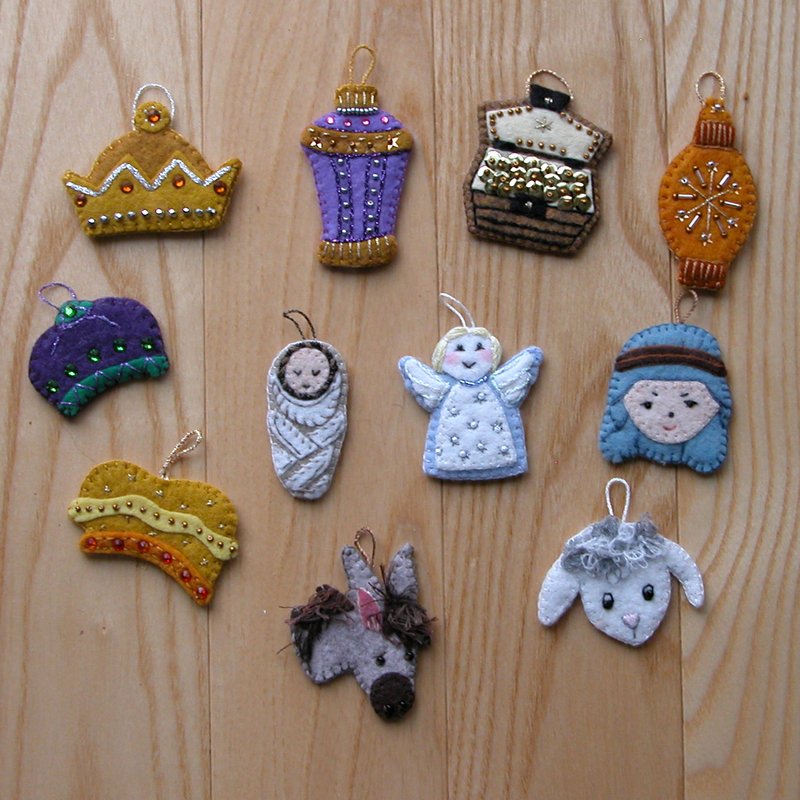 I also had difficulty in deciding what the ornaments should be, finally making the decision to design and make an assortment – some secular, some religious. This resulted in a whopping 42 ornaments! See what happens when you can’t make up your mind?!?! All ornaments have a heavyweight stiffener inside them(to help preserve them from the wear and tear of bending, etc.) and are totally finished on the backside. 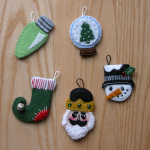 These ornaments are not the ticket for those of you who want a ‘quick project’. In all honestly, this calendar is not a quick project – more likely an heirloom work to be handed down and enjoyed for many years. My apologies to those of you who like ‘quick’!! 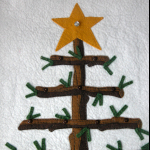 Embellished seasonal symbols – silver threads, Swarovski crystals, glass beads! 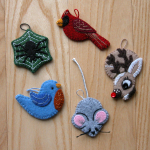 Holiday and seasonal animals – even the German Christmas spider! Music, nature and holiday candle light! Snowglobe, Frosty, elf shoes, nutcrackers and bright lights! The ‘reason for the season’ – symbols of the nativity! Holiday fun! Warm clothes, snow play, even a sleigh! 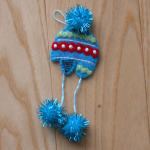 I love my knit hat – so fun to create! 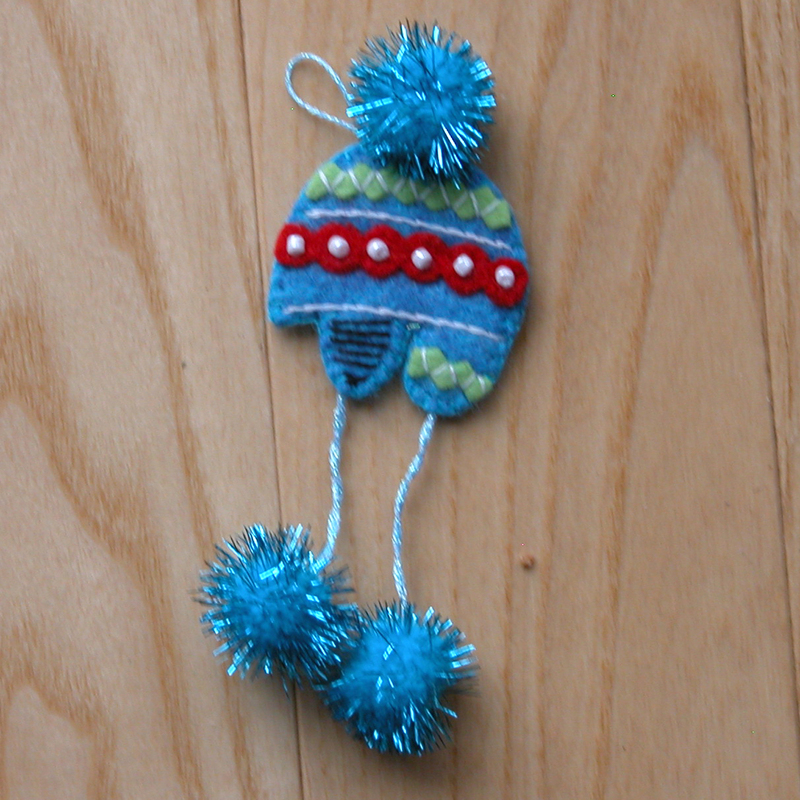 The back side of the knit hat – all ornaments are totally finished! All ornaments – except for the ‘bright star’ – are shown here. 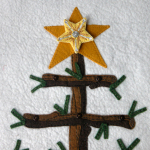 The bright star is shown buttoned in place on top of the plain star. All ornaments are designed to hang by a thread loop stitched into the ornament and looped over a button sewn on the yule log ‘branches.’ The ‘bright star’ has a button hole and is buttoned over the single crystal button that is in the middle of the plain gold colored star at the tree top. IF – and that is a BIG IF – I should decide to make this into a pattern, there are so many options to consider. How about using just one of the ornaments – like the bulb light…or the birds….and making 24 of them in different colors, etc – so you could have a tree with a just lights, or just birds, etc.??? Same with the ornaments – decorate them all a bit different – put initials or numbers on them – spell out Merry Christmas or any other holiday greeting??? 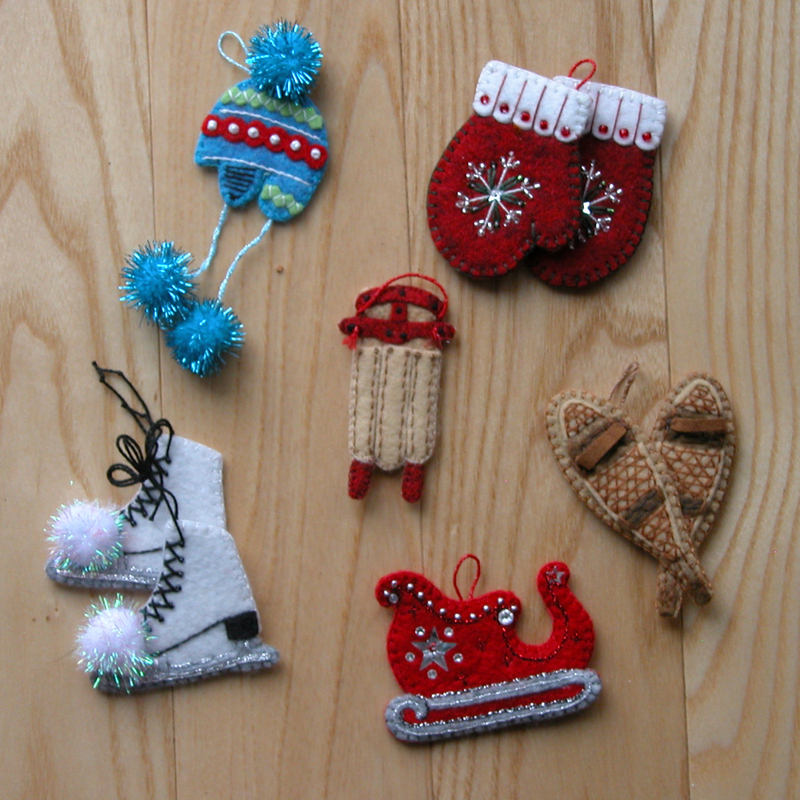 Make ornaments only for the winter season and leave the calendar up into January or even February to enjoy! 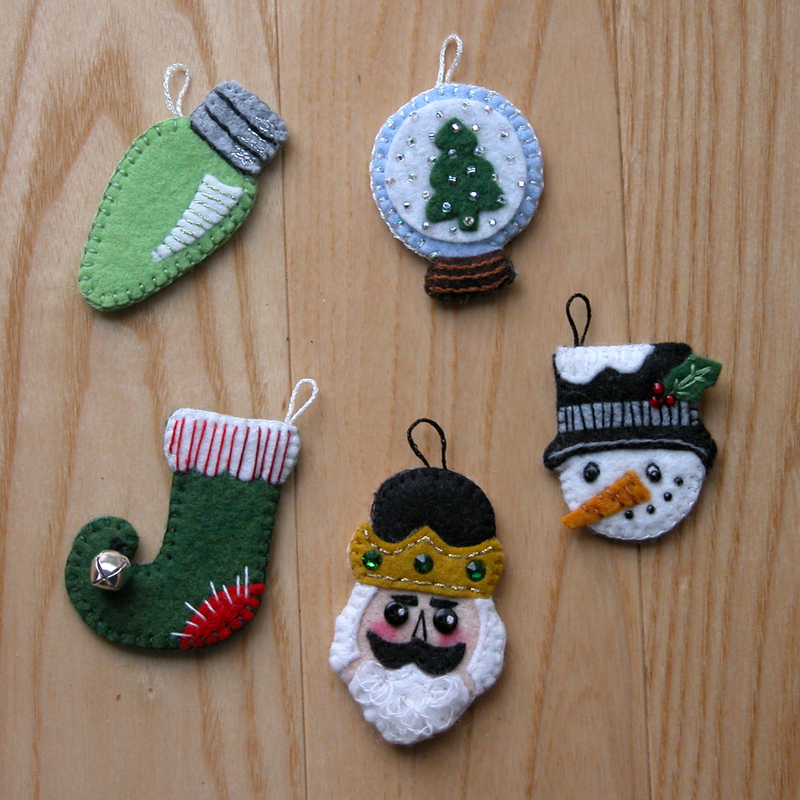 How about stitching ornaments with cutouts for little portrait photos? Want me to continue?!?! 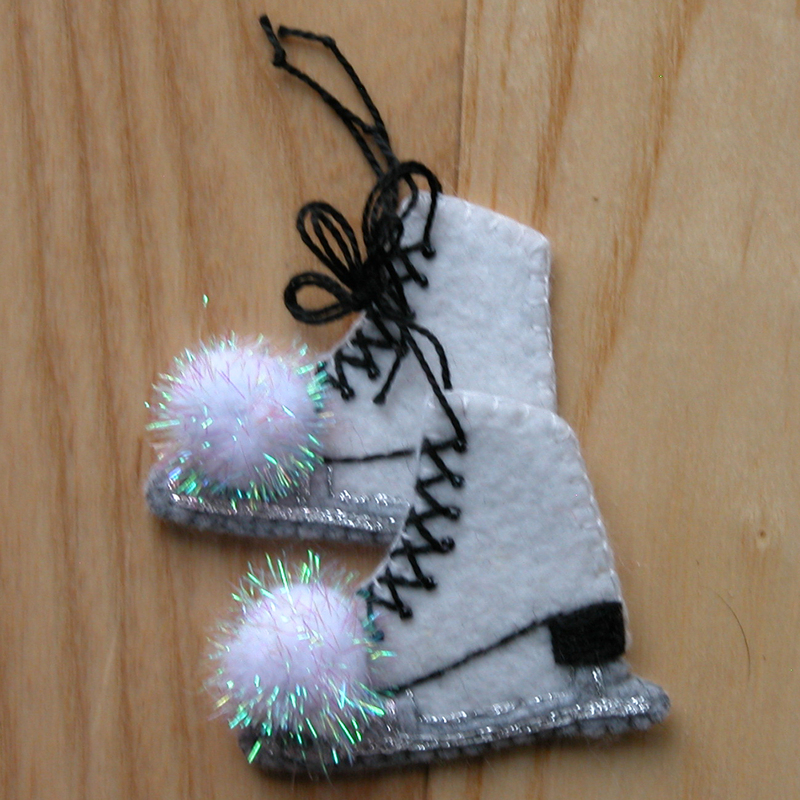 These ice skates were really fun to make! 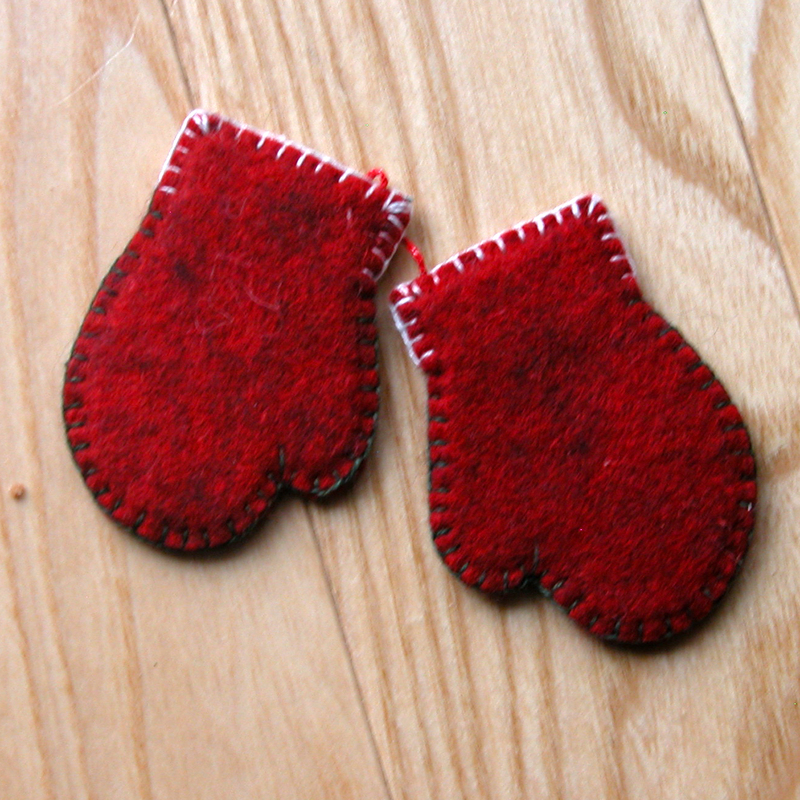 One pair of brightly colored mittens – stitched and beaded! 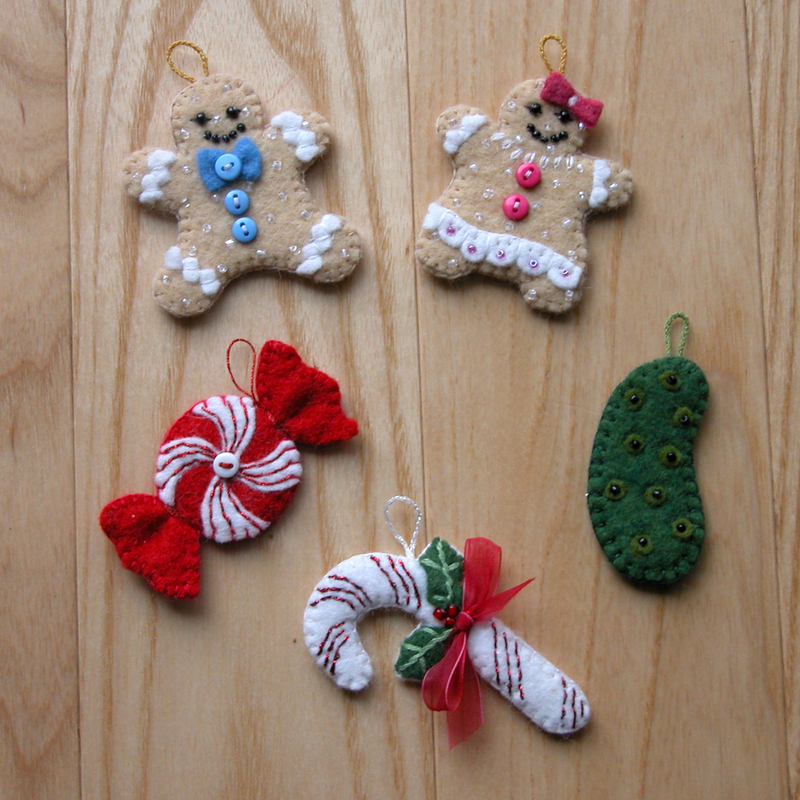 Despite the long hours, it was all fun to create these ornaments. For those of you who know me, you know that I dislike things like knots showing, etc and so all these ornaments are completely finished on the back. See the photos of the backside of the hat (sorry the photo is a bit fuzzy) as well as the mittens; I just happen to think this finishing not only makes the ornament much nicer, but adds to it’s longevity. Looking at each one now, I have to smile: I love my donkey – “all shaggy and brown” as the song goes. The snowshoes were a rewarding challenge as was the Magi’s gift of the box of gold. The snow globe was so simple it surprised me!. The folded star is actually folded and the ice skate laces are tied together just like we used to do it when I was a kid! I tried to to imagine how much fun it would be – as a child – to anticipate just which one I might pull from the pocket for that day – which meant one more day closer to Christmas! I would like to hear what you all have to say about the possibilities of making this into a pattern. I do realize this is not for those of you who want ‘quick.’ Is there still a market for those projects that involve more time and commitment? I am tossing around ideas of perhaps a few ornaments offered on line monthly – so it wouldn’t seem like such an overwhelming project. Remember, no one would have to make the number of ornaments I made – all you need is 24! 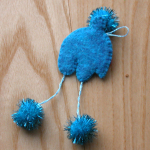 The project could be done in felted woven wools, but I would recommend that if you want to remain sane, the ornaments be done in wool felt. 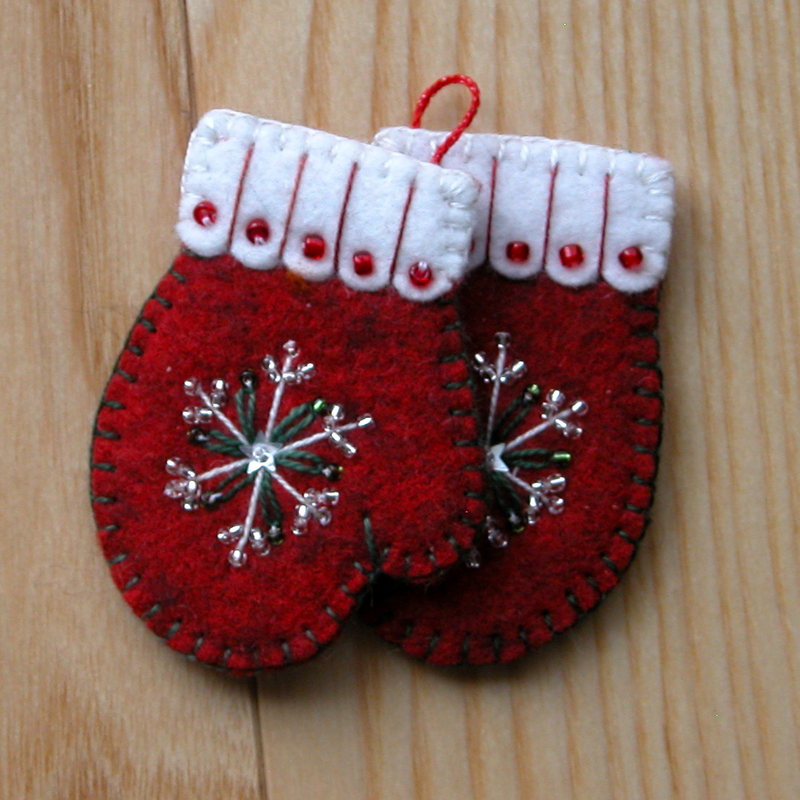 I did everything in wool felt – just plain easier for those little ornaments. Please send me any thoughts or comments. Check back in a few days as I will be posting a few other projects I have worked on! Meanwhile enjoy the Thanksgiving weekend! I’d love to purchase the pattern. With all of the ornaments for options. Jodie and Leona…Thanks for taking a peek! You’ll need to be patient 😉 I still need to finish the calendar, and then I need to think about how to make it both practical and reasonably affordable if I draft and produce it as a pattern. I even talked to my son – who helps me with the website – about what it would take to do you-tube video tutorials about the process I used to make the ornaments,etc. I’m also looking into how to make some of my future patterns downloadable – this gets tricky since I use different textures, etc. to designate pattern parts and when things get converted to a PDF the textures can really change, etc. If you haven’t already, be sure to ‘Like’ my facebook page – https://www.facebook.com/DesignAndBeMary – and that way you’ll get a heads up on my ‘pattern progress’!!! I love the integrity of these little ornaments. So classic! The tree itself is a thing of beauty. I would be proud to be able to make one (or three) of these. Thank you Lynne! But I’ll issue a warning – once you get the techniques down, these ornaments can be addictive! I still wake up in the middle of the night and think “oh I should’ve made this or that”! The ideas never end. 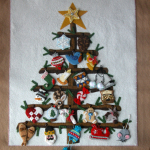 How about an entire tree of birds – all done in various colors and embellishment? Or ornaments made with family names and/or dates on them. What about a couple of ornaments that are specially ‘marked’ to designate that they come with a Christmas treat? Oh, I know…how about inserting one of those little plastic ‘squeakers’ into an ornament – just for fun?!?!? A few more secular characters and you could have a total ‘nativity’ tree. The ideas never end! Would love to make this. 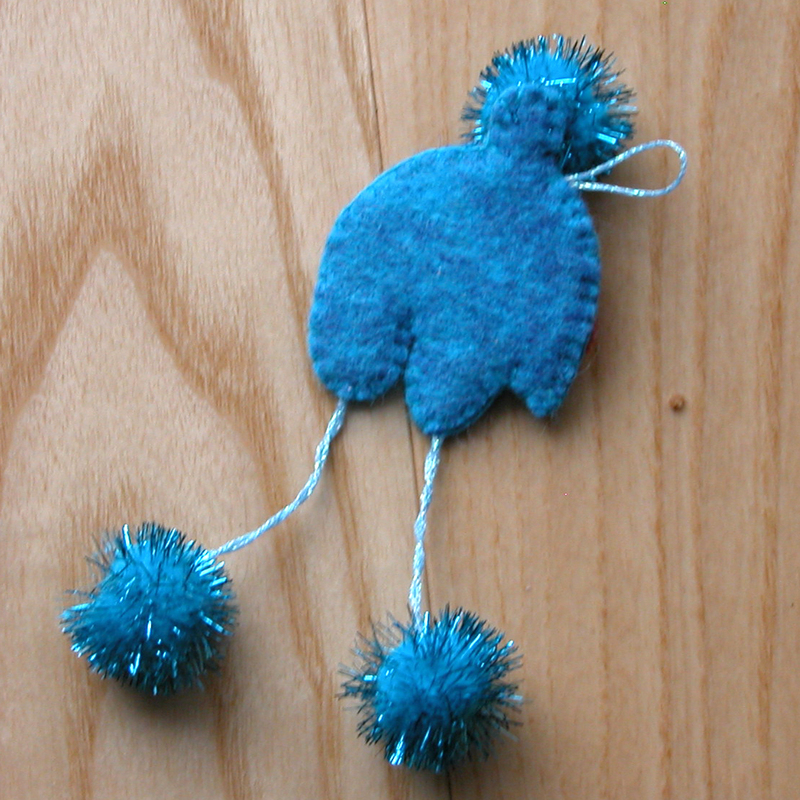 When I was a teenager, I made all of the Bucilla kits out of felt. I still have them. Oh Cindy! I with you here – have some ornaments that my mom made me from their kits and – (this is almost embarassing) – my tree skirt is still a Bucilla felt tree skirt with child like snowmen sledding around the tree and pom pom trim around the edge! Was wonderful when I had young children here! I keep saying I have to do a nice quilted skirt one of these years and so far it hasn’t gotten done! 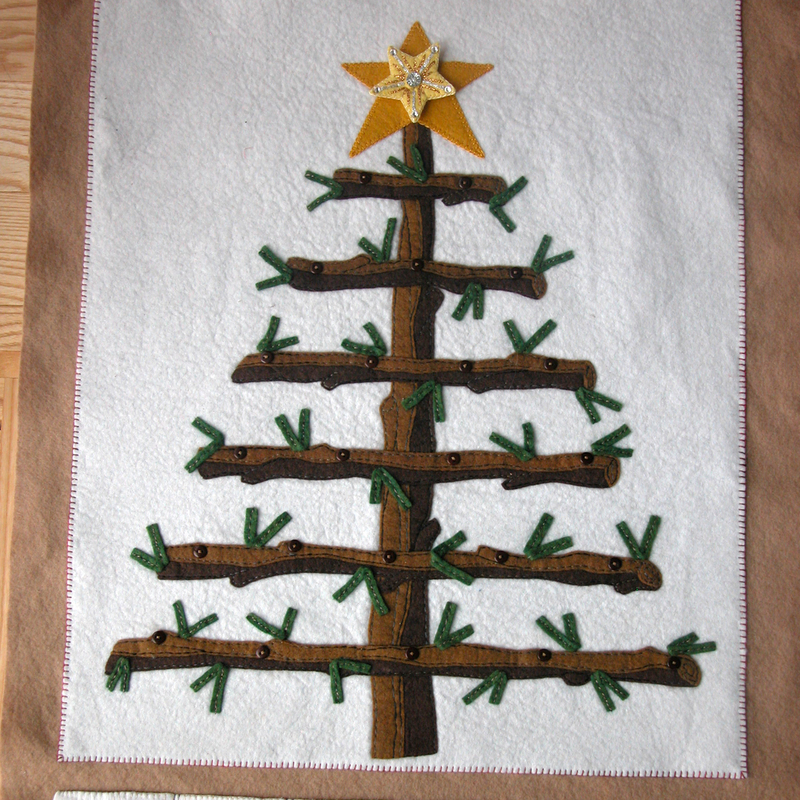 I did make a wonderful custom pieced and hand quilted tree skirt in the 90’s and gave it to my mom because she was always so proud of my art and sewing; when she passed and my dad was no longer able to be in his own home, I gave it to my brother and his wife. One of these years, I WILL get one made….when I’m not busy designing with wool and wool felt. Given all the wonderful comments and interest I have had in this, it will be first on my list to consider in 2015. It was not my initial intention for this to be a pattern and – to be honest – I didn’t think there would be very many people who would want to invest the time and work! Stay tuned in the new year! The tree branches are wonderful and I love the ornaments. I would definitely like the pattern, but with no children or grandchildren, I would use it as my holiday tree for my sewing room! (a loft over the living room that needs to look pretty) I might add a few extra northern themed ornaments since I live in a log cabin in the Adirondacks! Perhaps packaging ornaments in separate groups would be more palatable to the faint hearted, but I know many stitchers that would willingly dive into the whole thing. It is beautifully done. Ann, thank you for your feedback and comments. I LOVE hearing what people are thinking. All the years that I sold my art direct to the customer, I was able to hear their comments, opinions and thoughts; with the internet and website, it’s a bit different as there is not that direct contact. It is the comments that help me to improve my designs, instructions, blog, website, etc. I have been considering exactly how to produce this pattern. 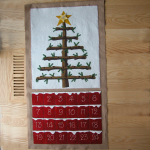 Originally had thought about doing the basic calendar as the pattern and then, in considering all the ornaments (I have 42 of them – more than the 24-25 that one would need for the calendar days) I thought about grouping them – maybe by theme such as ‘outdoors/sports’, religious, treats, Christmas icons, birds/nature, etc. – into separate sheets for each grouping(ex. 4 ornaments per page, etc. ), thinking that a customer could choose up to so many pages of their choice. After all, as I was working on this calendar, I had several ideas such as just using a single ornament i.e. 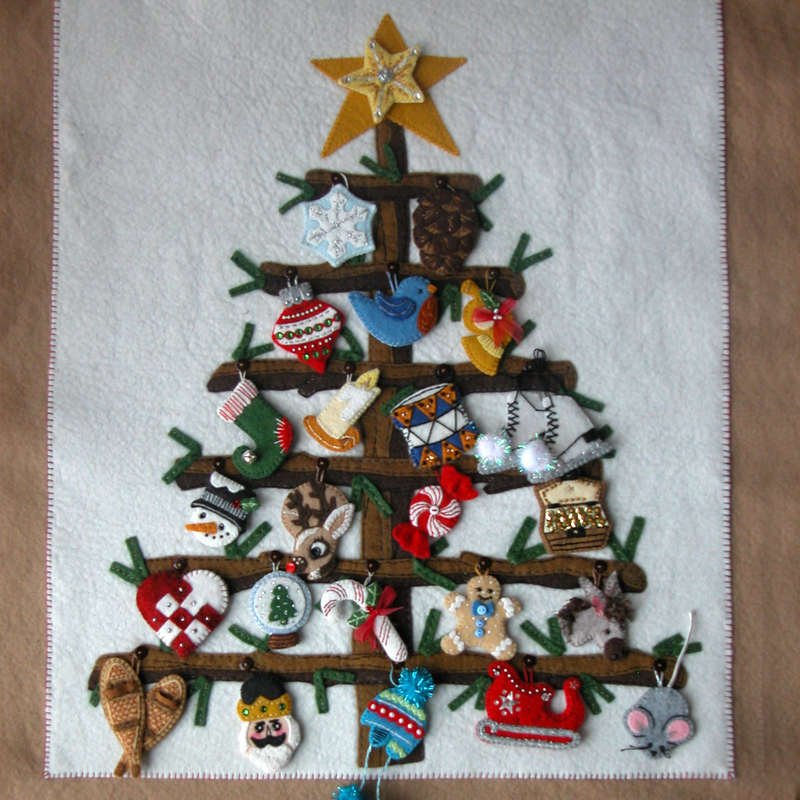 the Christmas bulb, but making it in all different colors, etc and have a tree full of bulbs – or – using the (2) bird patterns and again making all kinds of birds in different fabrics/stitches, etc. One idea that I had, but did not work up, was to string beads so you could hang them from button to button among whatever ornaments you wanted. I had been looking into the idea of making them downloadable, but there recently was a new law passed and now merchants must file and pay a tax on anything downloadable that is sold outside the US. It is my understanding that it is fairly involved – paying for a sales license,etc. I have no desire to complicate my tiny, little business with such sales. While I have it clearly listed on my site that I do not ship outside the US, I cannot stop someone from ‘buying’ a download from me internationally (perhaps there is software, etc. for large businesses that could exclude such a sale from a site) – and that would result in a need to be continually refunding money, etc. Soooo…it doesn’t appear that I will be using downloadables – unless I do free projects (which is on my ‘to-do’ list for the future!) 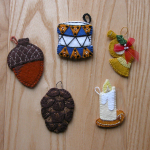 I agree with your idea of making the ornaments available in groupings and that is likely the way they will be done. Now I just have to figure out the ‘how’! Please stay tuned – I know that this pattern will probably not get done until late spring as there is a lot to work up with all the ornaments, etc. PS. Visited and camped in the Adirondacks in fall of 2008; while it was rainy, we found it to be very beautiful there. You are a lucky lady. I would LOVE to live in a log cabin! Please, please, please offer the pattern for your tree. It is gorgeous. 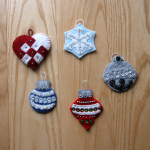 I would love to create all of your ornaments, but having the tree is the key! Little grandchildren could hang their handmade, paper and string creations as I find the time to create the beautiful heirloom ornaments. An ornament per month for two years, and I’m done! I can imagine the fun of coloring and hanging little paper gingerbread people to fill in the tree while the beautuful wool ornaments are under construction. And the grandchildren would have happy memories, either way. Your tree is SO beautifully designed. I love it! Can’t believe I just discovered it! Oh Karen, thank you for the wonderful comment. I AM working on the pattern. It has been quite the process and very different from my other patterns. I spent considerable time debating on whether it could be written and produced in a ‘doable’ and affordable manner. Since I am a ‘very small potato’ in the huge sack of designers, my resources fall short of being able to afford things like printing on large sheets or in color; so I have to resort to creating ’tiled’ pages (those are the pages that can be printed on 8.5 x 11″ paper, but require the customer to tape all the pages together to form a large sheet!) and making my drawings so that I can use all kinds of black and white ‘textures’ to distinguish parts and pieces! A piece this size (actual size is around 40″ x 22″ requires about 12 pieces of paper to tape together just for the main layout – and that doesn’t include the instructions! Most of my other patterns consist of around 7 to 9 pieces of paper total. AND there are about another 12 pages that will have all the ornaments on them. I started adding this up and suddenly a complete pattern would have over 25 pieces of paper – and that causes me to think that not only would I have to charge more, I might have to find a different size bag, etc. for the pattern since I don’t think I could fold the pattern sheets and fit them into the usual 6.5 x 9.5 plastic bag! Remember that song about one bone being connected to the next bone?!?!?! 🙂 As I work I am also considering other possibilites such as selling the ornaments as a separate package(not sure?? ), etc. Some of my choices also are affected by what I can do with my fairly basic website. But while I think all of this through, I have been busy drawing and working on the written instructions! If you have read any of my other posts, you will have discovered that I have some health issues that tend to create a bit of havoc now and then, so I would never claim to be fast! 🙂 I do try to be accurate and efficient though! In my wildest dreams I am hoping that this pattern will all be together and available by early summer. (I also have the photography to do!) Now all I have to do is pray that my lymes/CFS/FM will play nice and let me get the job accomplished!! I suggest that you sign up for the RSS feed, and will then be able to ‘stay tuned’ for news regarding how this is coming along! Karen – You made me smile!!! 🙂 I can only imagine what I could get done if I didn’t have to deal with a computer and pattern printing issues. But then again, I guess that is part of the package when I decided to make a few patterns! 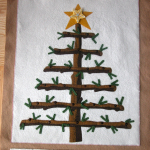 Thanks for signing up for the RSS feed – hopefully you will have seen my latest post with a few pictures of some of the drawings as I prepare the Yule Tree Advent Calendar pattern. Enjoy!